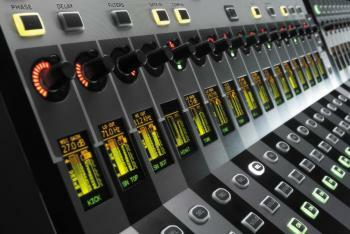 Unveiled at PLASA 2008, Soundcraft has introduced a mid-market partner console in the Soundcraft Si3. designed for live use on both touring sound systems and in fixed installations. Its intuitive operation and high input and bus count makes it a good choice for House of Worship sound systems. Theatre users might also find the Soundcraft Si3 applicable in their area. The Si3 has been showcased most recently at Winter NAMM show 2009. As the Si3 comes in one chassis it can literally drop in and replace an existing analogue desk as almost certainly no additional cabling would be required to install it. This compact footprint desk can directly handle 64 mono inputs, 4 stereo inputs and has full connectivity for all 35 output busses (24 Aux/Group, 8 Matrix and Left/Right/Centre mix buses). The Si3 also features four Lexicon effects processors, 12 VCA groups, 8 Mute groups and bar graph metering for all 35 bus outputs. Although the Si3 does have a small central touch screen, it is really there for console management, cue-lists, labelling etc. All the normal day-to-day mixing operations are carried out adjacent to the channel faders continuing Soundcraft’s philosophy of ‘where you look is where you control’. An amazingly crisp and bright OLED display clearly shows important channel data for every fader on the desk, while in the centre section, OLEDs provide the same for the output faders. Soundcraft has revisited the control topology employed on the Spirit 328 and 324 digital consoles, and made it even easier. The model is this - above each fader is a rotary encoder, the function of which changes according to the mode selected. This ‘bank’ of encoders, known as the VCS or Virtual Channel Strip can be set to control every function of a channel (known as Channel mode), so mic gain, EQ, dynamics, auxes, panning are all controlled as if you had a normal analogue channel strip laid sideways in front of you. The VCS also incorporates all the switching you would find on an individual analogue channel strip (48v, Phase Reverse, EQ in, and more). Alternatively, in what is called Global mode, each encoder controls the same function for each channel. So, for example, the encoders could control all the mic gains, pans or a chosen Aux bus which can be useful for creating monitor mixes. The encoder and OLED displays located in the output section are used primarily for output signal controls such as EQ, dynamics, Matrix contributions, but also double up as dedicated controls for the Lexicon processors. When using the Lexicon processors, you can expand the controls to adjust virtually every parameter available, giving you outstanding control over the effects. Each of the four Lexicon engines can be assigned by the user to any channel. The gates and compressors draw on the heritage of BSS Audio and dbx, Soundcraft’s sister companies within Harman. The output encoders and OLEDs can also be assigned to control EQ and Dynamics control for any selected Input or Output channel for those who prefer central control. Like its bigger sisters the Soundcraft Vi4 and Vi6, the Si3 uses the patented Soundcraft FaderGlow system to show what mode your faders are in, whether they are controlling inputs, aux or effects sends, or bus outputs. For example, when faders are controlling Aux sends, the faders glow yellow, while for VCA’s they glow blue. In fact the colour codings closely follow the Soundcraft Vi6 setup. Complete desk settings may be stored as snapshots, as you would expect on a digital console, and these can then be sequenced from a Cue list on the central touch screen and controlled with dedicated snapshot automation buttons. Global snapshot filtering is also available. Connection to the HiQnet network is included. Under the hood of the Si3 is an array of new technology, most notably EMMA, a single-board digital mixing console with an embedded operating system. This compact pcb holds not only the processing and DSP to run the mixer with its EQ and dynamics, but also the four Lexicon AudioDNA chips. The team of developers at Soundcraft was responsible for the entire development and coding of this new mixing core which is also the base core of further new console designs already in development. On the rear of this highly-featured console are all the I/O connectors you’ll need. Sixty-four XLR’s for the mic/line inputs, four stereo line level inputs, 24 bus output XLR’s, eight matrix output XLR’s Left/Right/Centre mix output XLR’s, Left/Right/Centre monitor output XLR’s and comprehensive internal and external talkback and Oscillator connections. There are also eight analogue insert connections which allow outboard processing to be inserted into any input channel output bus. The power supply for the Si3 is integral to the chassis, and a secondary PSU module can be fitted for total redundancy. There are also four spare slots for other optional cards such as MADI interfaces or AES/EBU inputs. To make preparation of the console setup easier, Soundcraft is also planning to release an off-line editor for the Si3. This self-contained suite runs on a PC or laptop, and allows configuration of the console which can then be downloaded to the desk, saving precious on-site setup time. Just like with the Virtual Vi software for the Soundcraft Vi Series engineers can move between different consoles and take their shows and settings with them. The Soundcraft Si3 is bound to appeal to regional tour sound companies and regional theatres, medium sized Houses of Worship and Corporate Event sound companies.